After almost 3 years, we are delighted to invite you to join us once again at Skybar Dorobanti for a memorable evening! 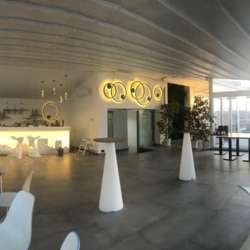 Located on the top floor of a building in Calea Dorobantilor, Above the city Skybar is a lounge concept that impresses with its unique, design and special atmosphere. By day, the location is the perfect place for relaxation, ideal for business meetings, while at night it becomes the perfect location for great moments with friends above the city under the clear sky in a relaxant atmosphere! The location is covered by a unique structure which protects from rain, wind or snow, but can be opened to ensure the unique view of the clear sky. The event will start at 21:00 with some general networking and chatting with our friends. Later at 22:00 music will start playing. It will be also Stefano's farewell, as at the end of April he will move to Sarajevo and therefore he will be glad to meet all of you and raise the glass for the last drink together. It will be also the opportunity to know Gabriella, which will replace him as Ambassador together with Marzia. It will be an unforgettable experience! Don't miss it! As usual, everyone will receive a free welcome drink (choice of beer, a glass of wine, nonalcoholic cocktail or soft drink). Skybar Calea Dorobanti no 155, Etaj 5 street .